Hello friends. 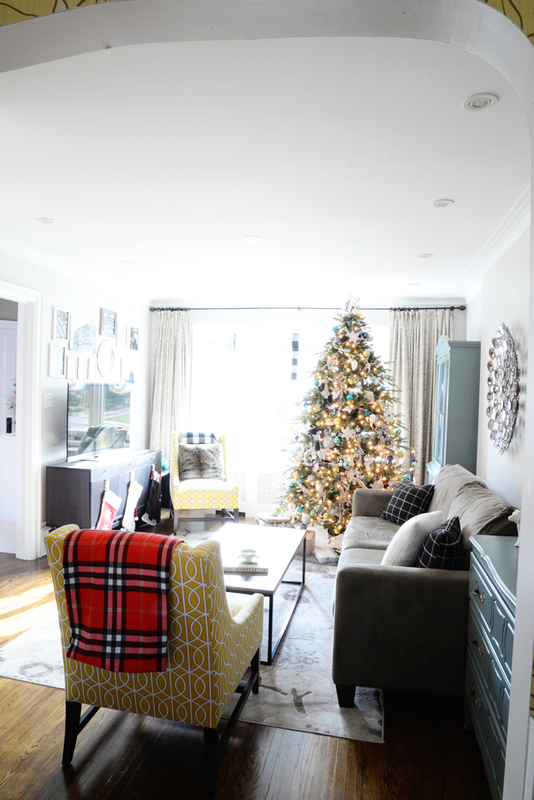 I'm so excited to share our home with you today as part of the Canadian Bloggers Christmas Home Tour. If this is your first time here, welcome! 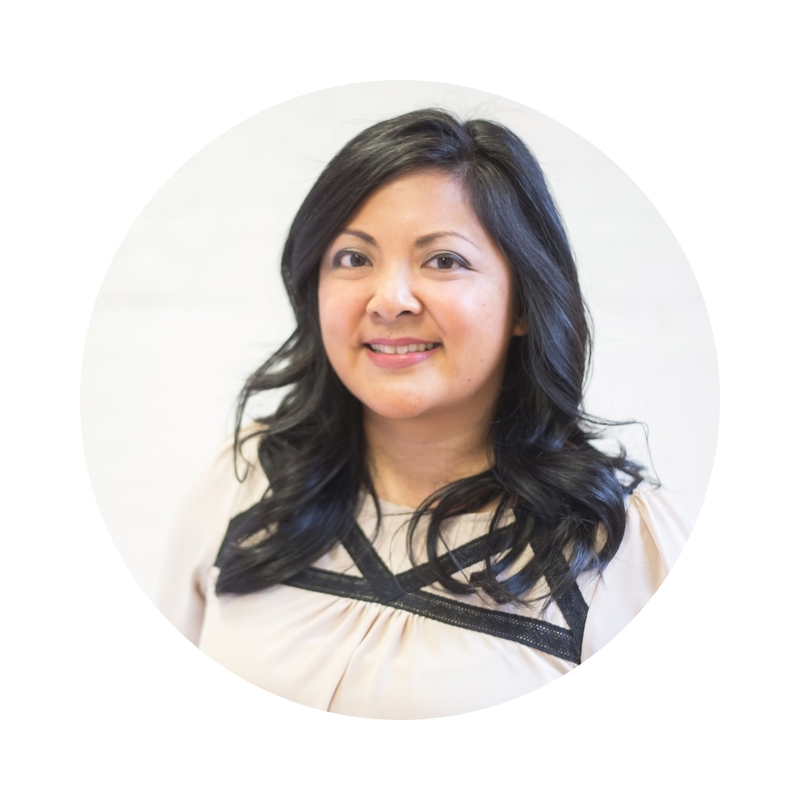 We live in the heart of the city in a typical Toronto home. Let's start in the living room. At Christmas time, I happily give up a quarter of the floor space in this small room for the tree. 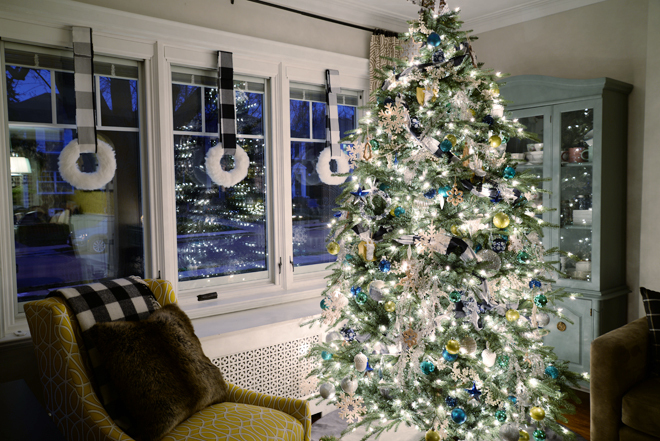 The living room is at the front of our house and thanks to the new window I now enjoy seeing the sparkly tree when I drive up to my house. 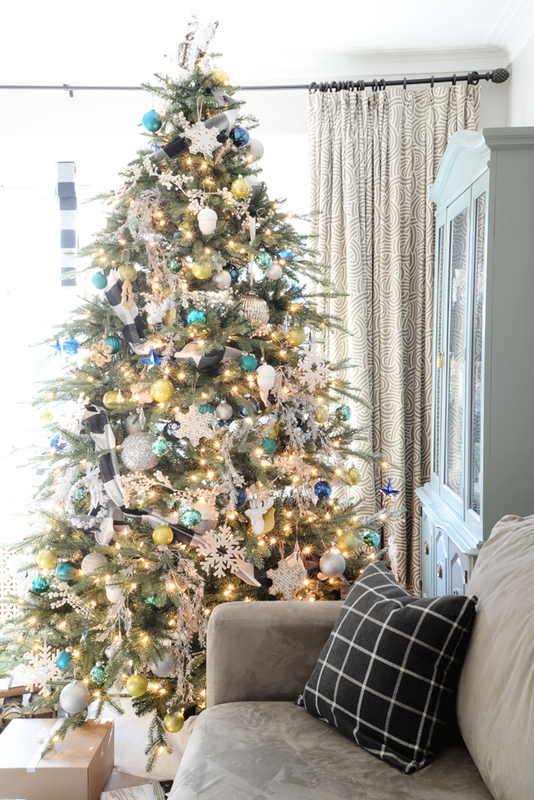 I'm honoured to be one of the bloggers promoting the CANVAS Christmas Collection this year and it was love at first sight when I saw Canadian Tire's Christmas trees. They are so life-like that I had to get this one for my very own (the Harrison). 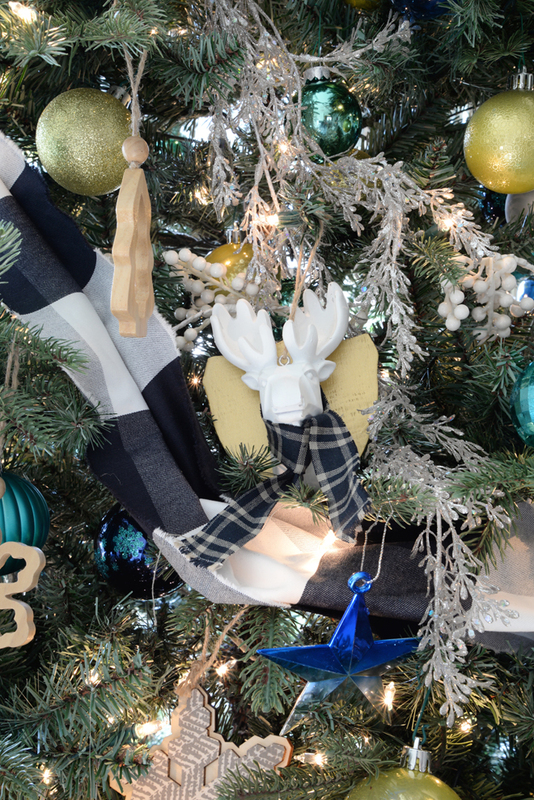 It has hundreds of pointy tips, just perfect for hanging delicate ornaments that catch the light. 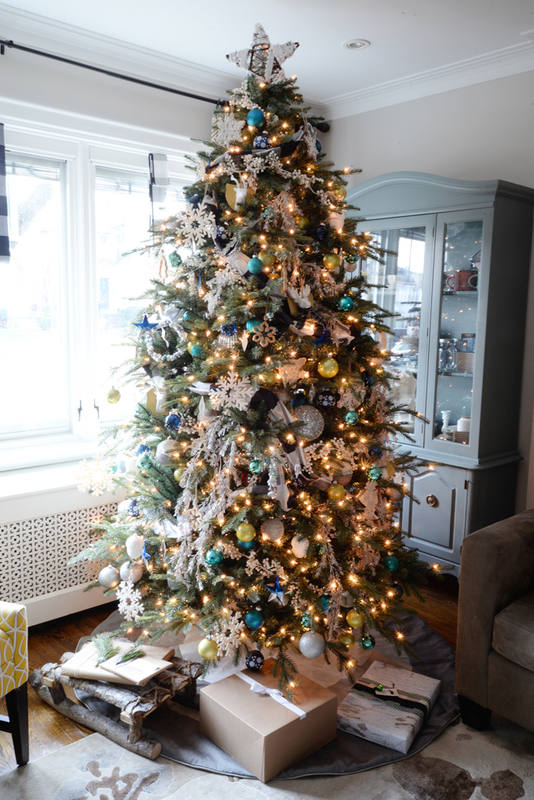 Editing is not my strong suit so I piled this tree with all my favourite ornaments. 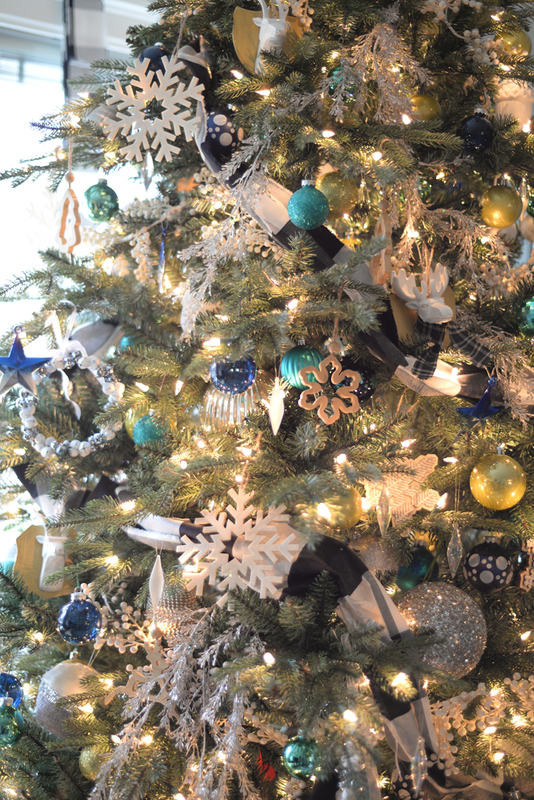 White berry garlands, wooden ornaments, ceramic acorns, felt snowflakes, moose (in scarves! 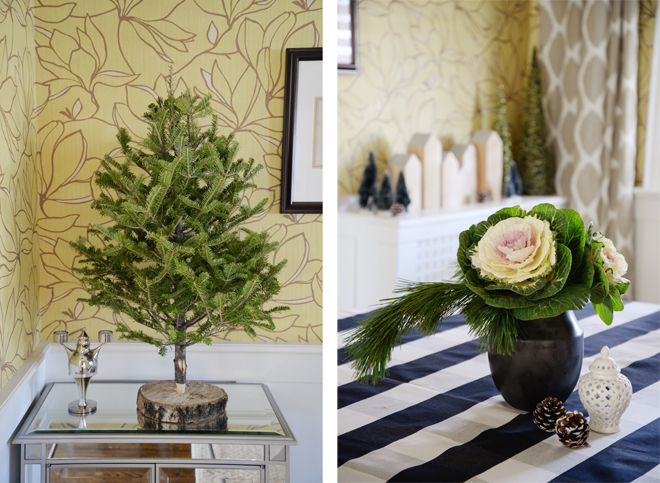 ), and draped silver sprays combine for an abundant cozy, wintery feel. 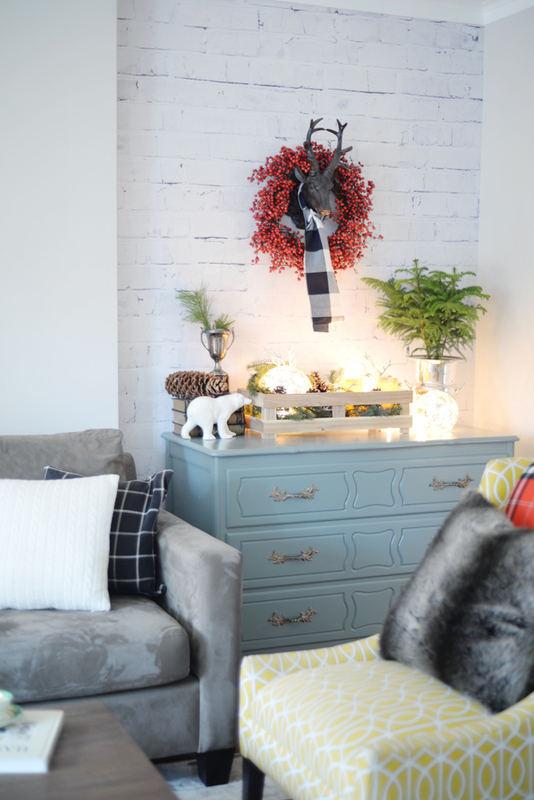 Teal and yellow are dominant colours in my living room and this year I decided to work them both into the decor. Shiny balls in citrine, cobalt and teal add sparkle and bold colour. 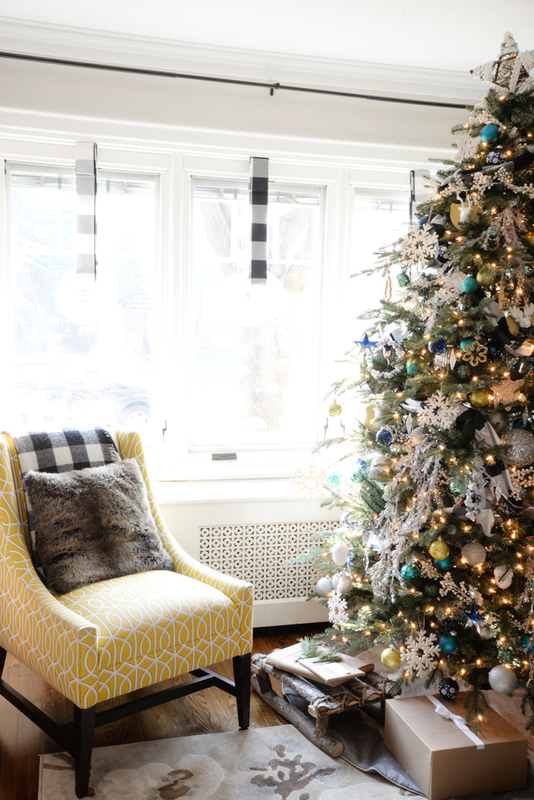 My favourite plaid IKEA Berta fabric makes an appearance once again: this time, cut in long strips and wrapped around the tree to bring a modern touch of black and white. I've had a bit of fun with the small details. It's hard to see, but three fluffy wreaths are hanging in the window. Giant sugar pinecones fill the wood bin. 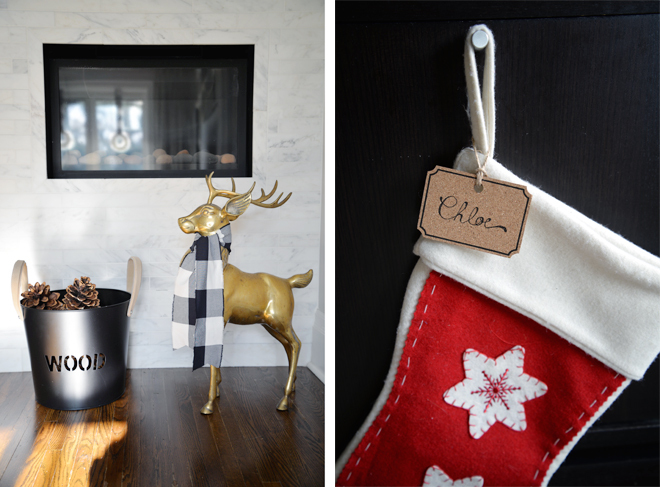 We don't have a mantle and Chloe decided our Christmas stockings should be hung on the sideboard this year. They get an update with handwritten tags. 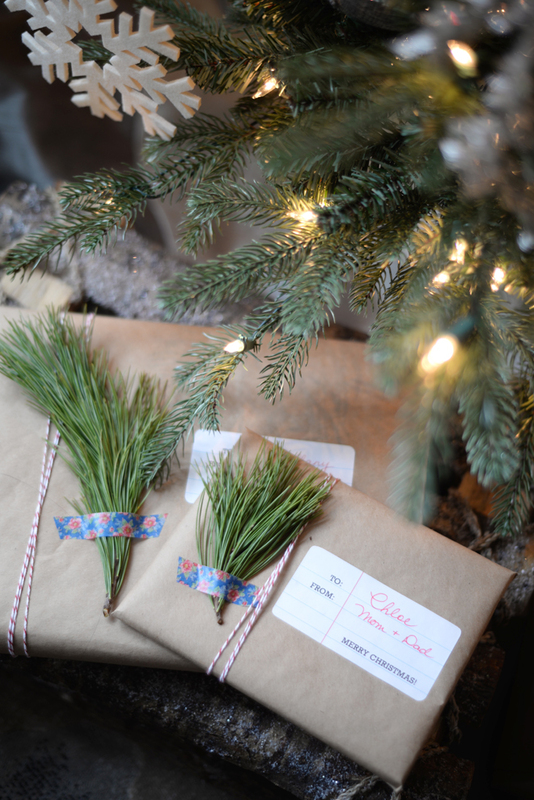 And the pretty packages I shared earlier this week have been placed beneath the tree. Just beyond this area is the dining room. 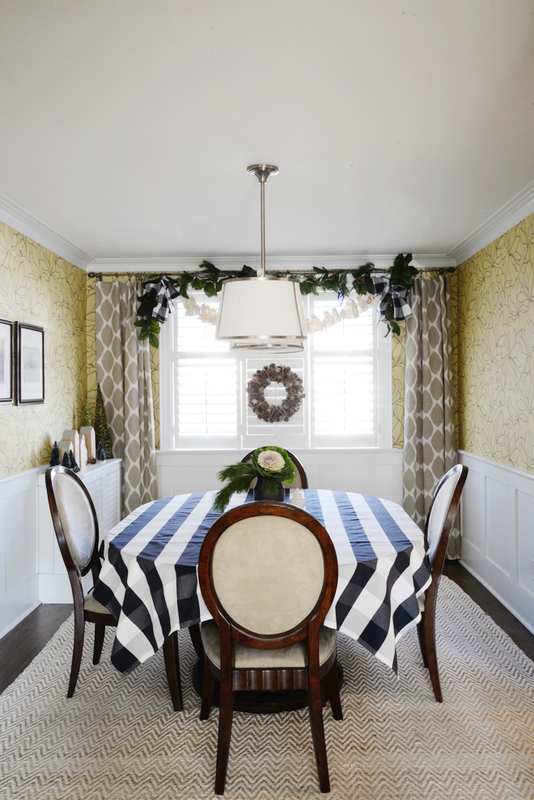 I've always found this room a challenge to decorate due to our bold wallpaper choice. But this year, I decided patterns don't need to match, you just need to be confident and make it work! 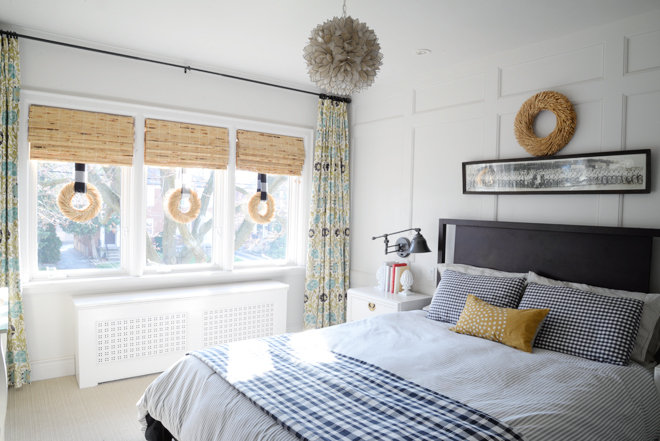 So this room is a mix of black and white, brown, green, and yellow; floral and chevron and plaid. I've kept the decor simple for now but the dining table will get decked out soon for our annual pancakes and pajamas holiday party. The Advent Calendar is strung across the dining room window. Opening those little bags one by one is one of my favourite holiday traditions. 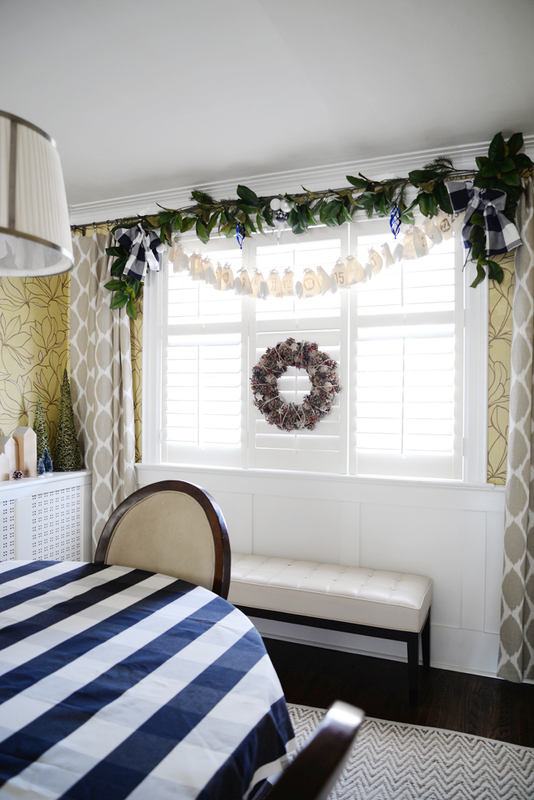 To frame the window, I've added a magnolia garland dressed up with more plaid bows. 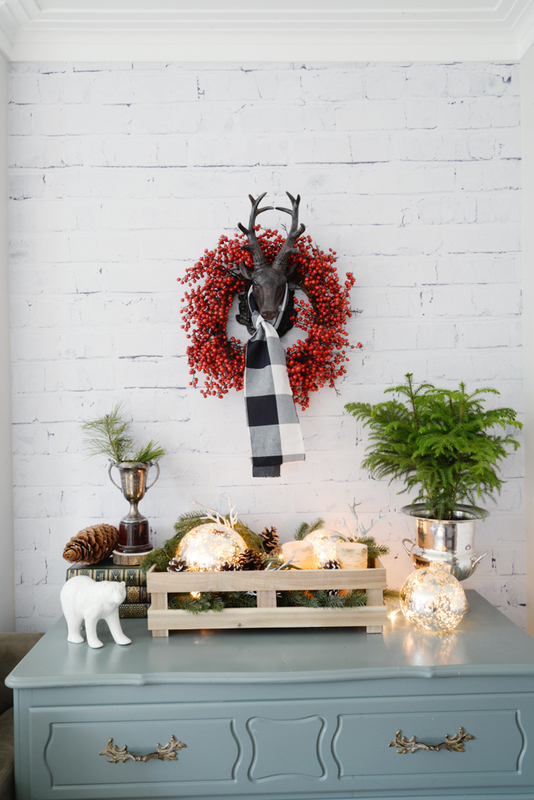 Tucked in the corner is one of our newest decor items. 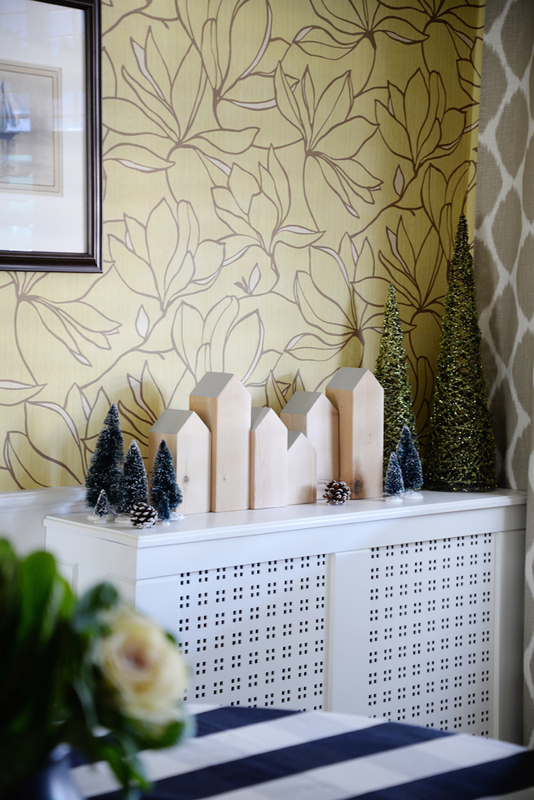 I made these wooden house blocks for the Style At Home "A Blogger Christmas" story we shot in January. They're made out of a cedar fence post cut to different lengths. The angled roofs are painted a very pale grey for a modern, minimal touch. 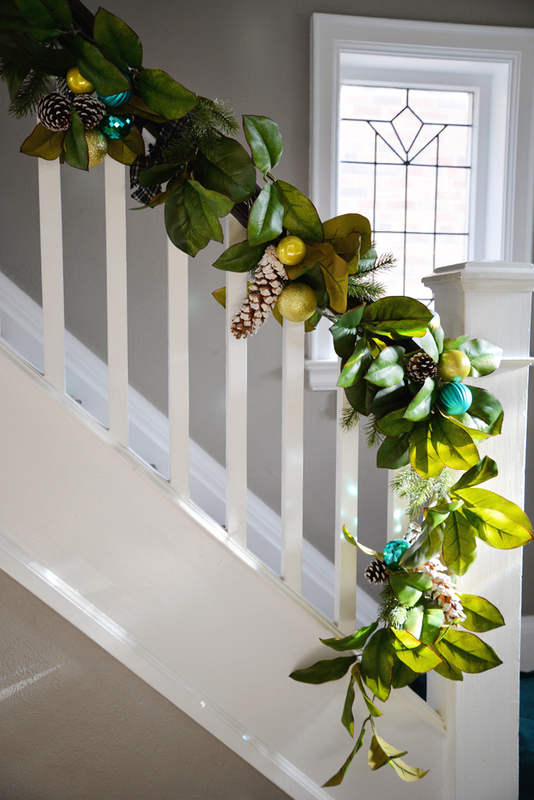 Back out at the entryway, I've used more of the magnolia garland on the stair banister. 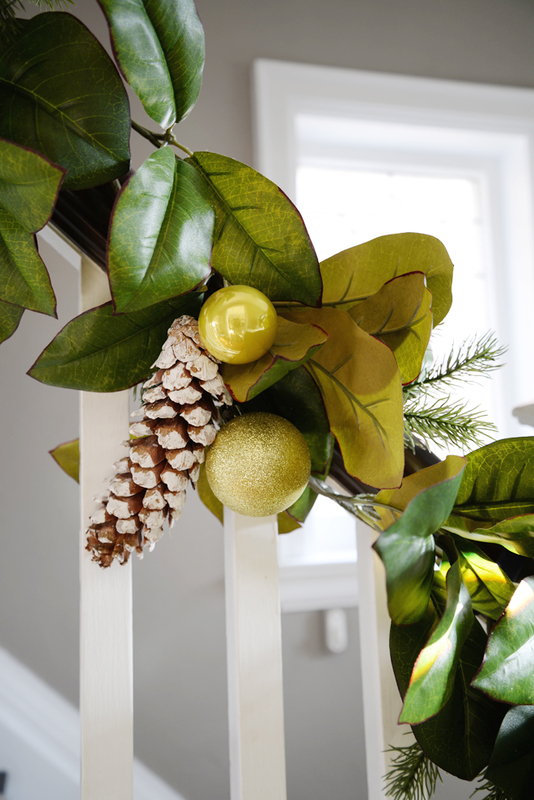 It ties into the rest of the decor with the addition of snow-capped pinecones and ornaments in yellow and teal. I've put this free-form arrangement in one of the windows. 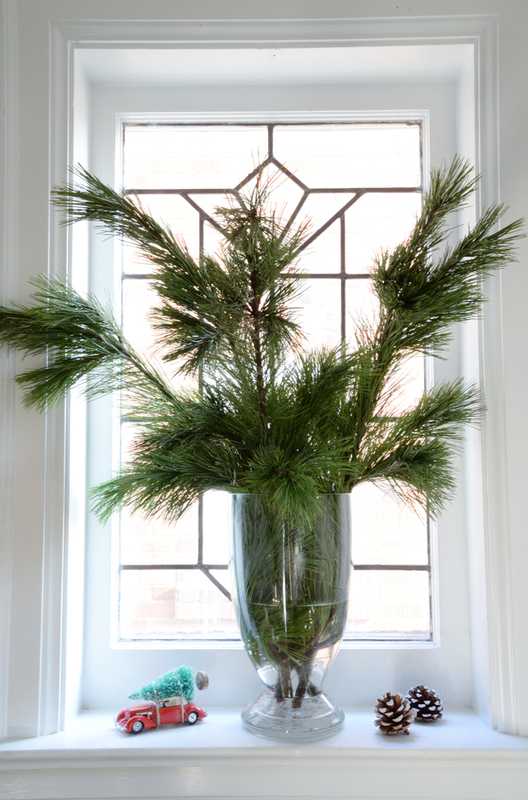 Long pine branches in a tall vase add colour and texture. 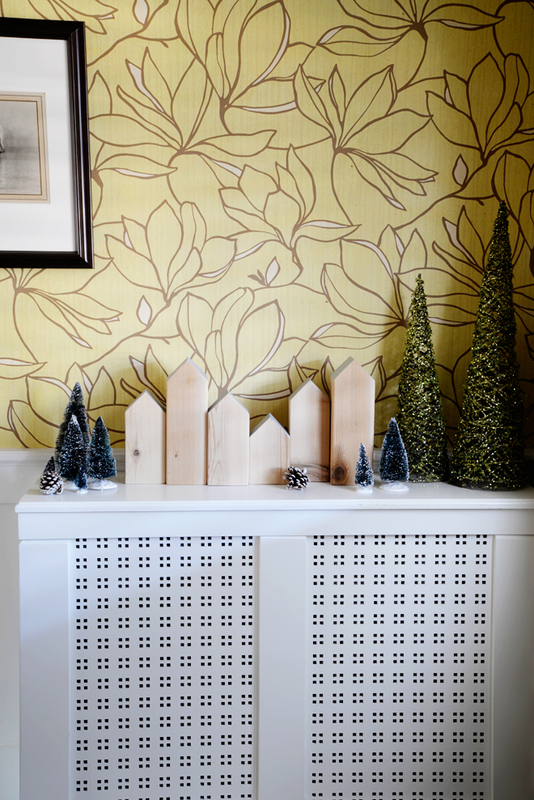 The toy car with tree on top, a seasonal favourite, is always found somewhere amongst our Christmas decor. Moving on upstairs, I've added just a few festive touches to our bedroom. 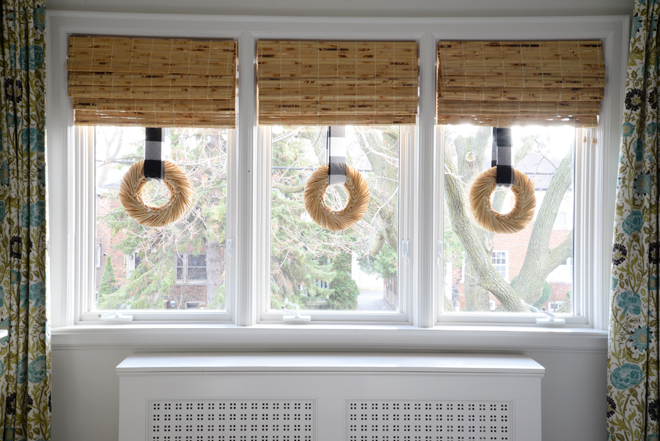 I've had these straw wreaths for years and typically hang them in the downstairs windows but it was time for a change. 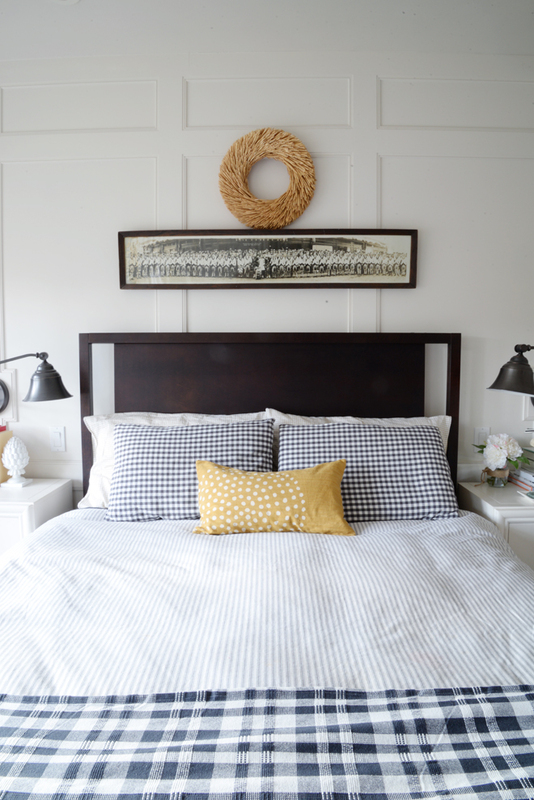 A matching larger wreath is hung over the bed. 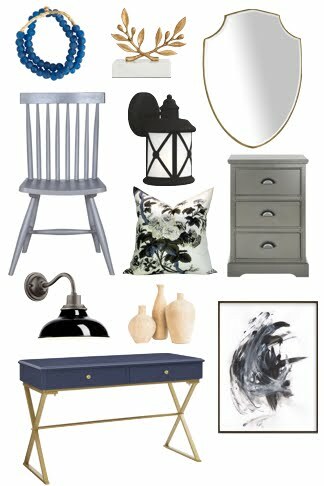 I'm really craving a simpler look with my decor in general and I think that's reflected in our decorations too. but lights are best enjoyed at night. 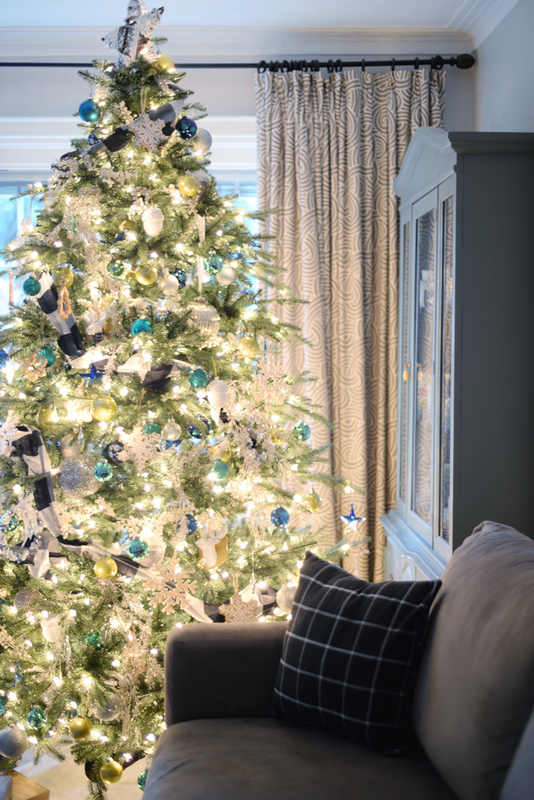 It's such a wonderful time of year and as I see all of these spaces, it makes me happy to know that these rooms will be filled with joy and love in the coming weeks. I hope you've enjoyed the tour. 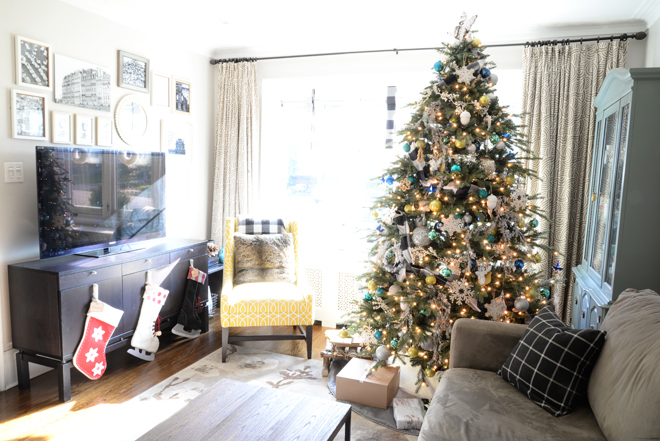 For more Christmas decorating inspiration, click on through to see the homes of these talented ladies who have been sharing their homes all this week.